"Finnmarken" north Tromsø strait this evening. hahahahahaha..... hopefully, they'll have these issues rectified at the conversion. I am not sure. whether it is a good idea to move the "bistro" upstairs. Today's shop and bistro area + arcades is a lively centre on today's ships where you can spend hours inside. I am not sure, if that will be the same, when there is no possibility anymore to consume something. Why sit down there without coffee or in the expedition area? The shop will have less visitors, too. Thinking about it, I totally agree with you for the very same reasons. Expedition area will become an area where you go to have certain things done, but not a place where you will relax with something to eat or drink. And so do I Ralf! I'm sad that she is leaving the Norwegian coastal route, but then, as an expedition ship she will be absolutely brilliant I believe. 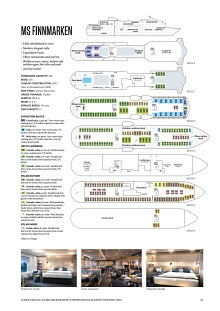 I saw this deck plan online myself yesterday but haven't had enough time to study it's details. But, I also noticed a BBQ area at the top deck. The renderings made available several places online as well, shows a very nice update. Substantially upgraded, low-emission engines, complying with all known and upcoming regulations (Tier 3), installment of shore-power connectivity and preparing her for future battery pack installation. All cabins and suites will be fully refurbished. Using natural Scandinavian materials such as granite, oak, birch and wool, this will create a relaxed and stylish look and feel, and add to the premium on-board experience. On deck 8 aft, in the current gym and sauna area, five large suites (pictured above) with large panoramic windows and spectacular views will be added. Restaurant Aune (pictured), Hurtigruten’s new expedition cruise main restaurant concept. Aune will be social and informal with the use of natural elements in design and interiors, and serves breakfast, lunch and dinner based on a Scandinavian identity. Restaurant Lindstrøm, a specialty restaurant named after the favorite chef of the Norwegian polar heroes, will be added. Lindstrøm will be an upper premium fine dining restaurant with strong roots in traditional Norwegian cooking that are contrasted with modern cuisine. The informal eatery Fredheim, named after a legendary 1920s hunting station in Svalbard that sheltered adventurers from around the world will be added on deck 7. In addition, a new grill venue will be added outdoor on deck 8. Hurtigruten’s signature Science Center (pictured above) will be added on deck 4. Packed with state-of-the-art technology and high-tech gadgets such as touch screens, science equipment and other interactive features, the edutainment area will also be the on-board HQ for the ship’s Expedition Team. The new larger wellness area (pictured above) will be added on deck 7, and includes a lounge, treatment rooms, gym and panoramic sauna. The outdoor pool area will be fully refurbished, the shop expanded, and her car deck will be replaced by the launching area for Hurtigruten explorer boats (ribs) and other expedition equipment. MS Finnmarken’s extensive art collection will be preserved during the refurb, which will take place in the first quarter of 2020. Too many rumours in my opinion at the moment. Let's wait and see. First the new ships have to be completed - by both companies: Hurtigruten and Havila. I don't see that date so far... just plans and projects. So true. A lot of rumours. Lets wait and see what will eventually happen. Finnmarken is a beautiful vessel and I know she is extremely popular with many people along the coast. Finnmarken south Tromsø strait tonight. From the phrase "the expedition setting on the coast" she may still be operating in Norway, though not as a true hurtigrute. And from that, as a "cruise vessel" she will not be accessible to non-paying guests/visitors. Sounds like I have to make one last visit to the ship(s) before they become "off limits". ....Does anyone know if Finnmarken will continue as a TRUE Hurtigrute in the next tender, or will she become an explorer-ship?